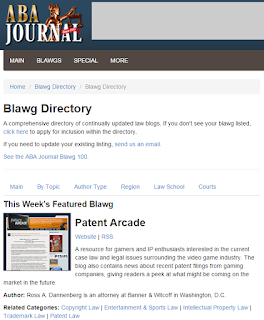 We are proud to announce that the Patent Arcade has been included in this year’s ABA Blawg 100 list of notable legal blawgs. The Blawg 100 includes only continually updated law blogs. The Patent Arcade has been in continuous operation for over 10 years, launching on April 5, 2005. Thanks ABA Journal! Much appreciated. Games Industry Law Summit 2019 Legal Challenge is now open!